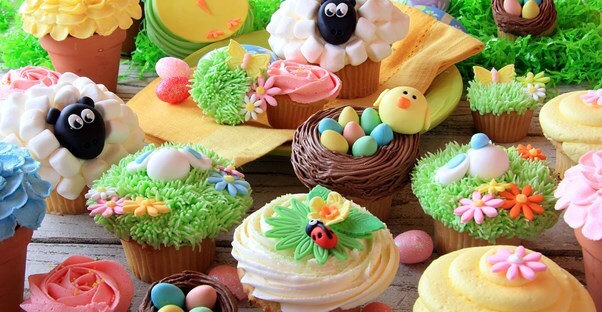 Along with the classic ham and decorated Easter eggs, there is another Easter food necessity: treats! Homemade treats are so much tastier and cheaper than their store-bought counterparts, so both your children and your wallet will thank you for preparing these. Your children can even help make most of them. Especially if you’ve been fasting for the Lenten season, Easter is the first day you’ll be able to enjoy those delicious (yet unhealthy) sweets again that you had given up, so why not make them as delectable as possible? Place the pretzels on a baking sheet and set one Simply Caramel on top of each of them. Set your oven to 250 degrees Fahrenheit and bake for three minutes (make them soft, not melted). Place another pretzel on top of the softened Milky Ways. Melt the white and pink chocolate in the microwave and drizzle over the pretzels. Add some sprinkles to form eyes, a nose, and tail. Let cool in the fridge for at least thirty minutes. Heat sugar and corn syrup in a saucepan over medium heat. Stir constantly until boiling, then set aside. Slowly stir Nutella into the mixture. Pour over cereal, coating every piece. Mold into nest shapes, using ¼ cup of the mixture for each one. Place on wax paper to harden, then add two or three eggs to each nest. Line an 8X11 glass dish with wax paper. Put white chocolate and shortening in a medium-sized bowl and melt in the microwave (usually two minutes, stirring every thirty seconds). Quickly mix marshmallows into the chocolate and pour into the baking dish. Press down to make the thickness even and make sure the mixture is touching the edges of the pan. Let cool in the freezer for twenty minutes. You can simply cut the bark into squares or use greased cookie cutters to make any shape you want.